The parish of St. Francis Xavier can trace its origin to 1847 when Father John Larkin and three other Jesuits established the Church of the Holy Name of Jesus in Lower Manhattan. Father Larkin purchased a former Protestant church on Elizabeth Street near Walker Street, and in its basement founded an academy with 120 scholars. Unfortunately, a fire caused by a new furnace in the cellar completely destroyed the building on January 28, 1848. It was decided not to rebuild on the old site, so Father Larkin sold the property. The academy was relocated temporarily to the basement of St. James's Church until Father Larkin was able to rent two houses on Third Avenue. Soon thereafter, Father Larkin was astonished to receive a letter notifying him that he had been appointed Bishop of Toronto. His superiors granted permission for him to escape to France in order to avoid this honor. His successor, Father John Ryan, continued to search for a proper location for a permanent college, finally acquiring the present location on West 15th and 16th Streets, between Fifth and Sixth Avenues. Plans were drawn up for a new church and college, to be named in honor of St. Francis Xavier. The cornerstone for the church, which faced 16th Street, was laid on September 24, 1850, and the completed church was dedicated by Archbishop Hughes on July 6, 1851. The first college building, facing 15th Street, was opened on November 25, 1850. Tragedy struck on the evening of March 8, 1877, when the church was filled with a congregation exclusively of women. During the sermon, a hysterical woman in one of the galleries needlessly shouted "Fire!" and the resulting panic caused seven people — six women and a little boy — to be trampled to death. Due in part to the great tragedy, it was decided to erect a new and larger structure on land immediately to the west of the old church. The cornerstone was laid "with imposing ceremonies" on May 5, 1878, attended by about 5,000 persons. By this time the side walls were about six or seven feet high and the chancel wall was nearly completed. The New York Times (May 6, 1878) reported that "The whole floor-level and walls had been planked over to accommodate spectators, and at the chancel end a higher platform had been erected for the clergy, choir, and orchestra." Built from 1878 to 1882, the church was designed by Patrick C. Keely, the prolific ecclesiastical architect from Brooklyn. Keely was known for his Gothic designs, but for St. Francis Xavier he created an exhuberant building in the classical "Roman Basilica" style. Facing 16th Street is the rock-faced facade of bluish-gray granite. The main entrances are sheltered by a gabled portico that measures 48 by 14 feet and rises to a height of 104 feet. A planned campanile tower was to be 180 feet high, but it was never built. Extending from street to street, the extreme length from the portico to the chancel wall is 190 feet, while the breadth of the nave and aisles is 178 feet. Rising to a height of about 74 feet, the interior of the upper church features frescoed medallions on the decorated barrel-vault ceiling and large murals of the stations between pilasters on the sides. There are five altars: the high altar in the middle, and those dedicated to the Blessed Virgin, St. Joseph, the Sacred Heart, and St. Aloysius. All are built of marble, with pillars of Mexican and Californian onyx. Numerous niches and brackets support statues of saints. The completed church was dedicated by Archbishop Corrigan on Sunday, December 3, 1882. After nearly 120 years of use, the church building was in need of substantial repairs, cleaning and restorative work. From 2000-2010 the congregation undertook a $12 million capital campaign to renew, renovate and restore the church interior and exterior. At this time the sanctuary (chancel) was reconfigured and enlarged by removing several rows of pews. The original high altar and reredos were moved forward to provide space behind for a new sacristy, and a new baptismal pool was constructed in front of the high altar. The liturgical south transept was reconfigured to provide flexible accomodations for choir seating, the organ console and grand piano. New organ chambers were created at the triforium level of the transepts. The renewed church was rededicated on Sunday, June 19, 2010. As part of its restoration campaign, the church contracted with the Peragallo Pipe Organ Company of Paterson, N.J., to build a new organ. Completed in 2010, Peragallo's Opus 700 is a hybrid organ that combines a total of 52 ranks of pipes—including 23 ranks from the previous Kilgen gallery organ—with several digital stops. 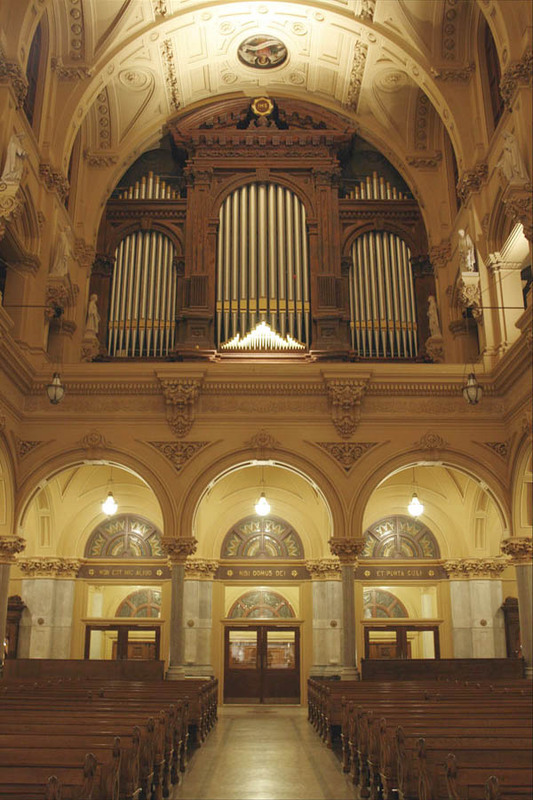 The organ was designed with a French tonal scheme by John Peragallo III, Tonal Director of the company, in consultation with John Uehlein, Director of Music. The main instrument is installed in two chambers that were created in the triforium on each side of the chancel. Fronting the four tone openings into the chancel and transepts are oak cases with façades of functional pipes that have gothic gold arched mouths. Frank Peragallo designed the case work. The Grand-Orgue, Grand-Choeur and Pédale divisions are located in the east (liturgical north) chamber and the Récit and Positif divisions are in the west (liturgical south) chamber. The Antiphonale division at the rear of the church is comprised of eight digital stops that emanate from behind the original organ case plus the 49 gold-painted pipes of the Trompette en chamade that are mounted at the base of the case. Built in 1881 by E. & G.G. Hook & Hastings of Boston, the noble hand-carved organ case was restored and its façade pipes were painted silver with gold mouths. Controlling the organ is a movable three-manual French-style console with terraced drawknobs and a hand-carved music rack that incorporates the Xavier cross. A complete MIDI interface and sound module allows the organist to access many digital effects for contemporary worship music and record and playback the instrument. The organ was dedicated on October 11, 2010, with a recital by organist Matthew Phelps, assisted by mezzo-soprano Robin Lynne Frye. The following specifications were provided by the builder but did not include pipecounts nor indications which stops are digital. 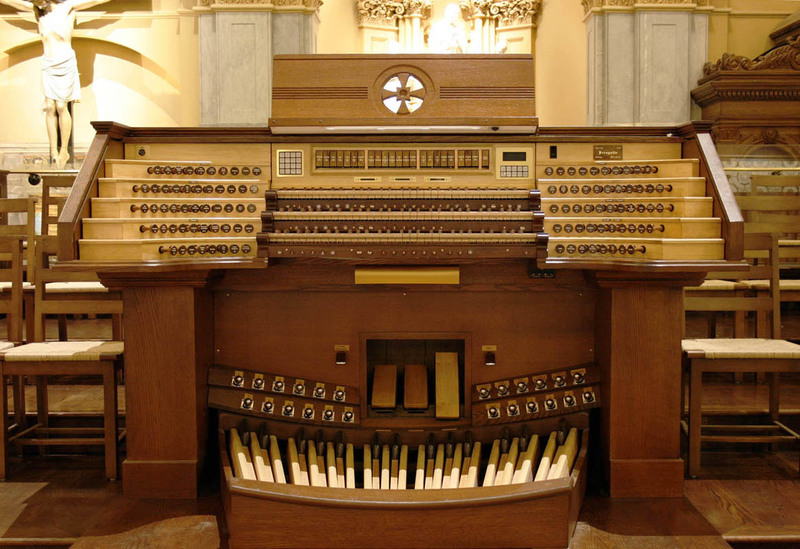 In 1957, the Kilgen Organ Company of St. Louis installed a new three-manual organ behind the 1881 E. & G.G. Hook & Hastings case in the gallery. Since its installation, the organ was modified by area organ builders; at the time of its removal in 2009 more than 30 ranks were connected or in storage behind the case. The following stoplist was provided by Rollin Smith, noted organ historian and concert organist. Pipecounts were not included but are suggested as based on similar Kilgen organs of that era. In 1902, Casavant Frères was engaged to electrify, rebuild and enlarge the 1881 E. & G.G. Hook & Hastings organ in the gallery. The contract, dated September 24, 1902, shows that Casavant would install electro-pneumatic action, add four new stops in the Solo and six additional couplers, and rebuild the console. Casavant also extended the manual ranks to 61 notes (with 65 pipes for the Solo ranks) and lowered the pitch to "International" A=435. At a total cost of $6,350, the organ was to be installed and working on or before the 8th day of September 1903. In a memo on the same day, the Rev. David W. Hearns, S.J., Rector of the church, approved the addition of a Cor Anglais stop for the sum of $150. Sadly, this grand organ was removed in October 1957 and was replaced by a Geo. Kilgen & Son organ having only 21 ranks. One Crescendo Pedal acting on all stops and couplers without moving the knobs. Four reversible Pedals acting on Manual to Pedal Couplers. The pipes, the case and front, the swell box will be used, all the rest will be new. The action will be our improved electro-pneumatic action working with a battery of seven cells. The present Hydraulic Apparatus will be retained to be used in case of an accident to the electric motor. The keys will be in a separate console placed in front of the gallery. The windchests will be pneumatic and with one pallet to each pipe, thus insuring a perfect supply of wind. All combination Pistons will move the knobs to show what combination is on. The Swell Shutters will be actuated by two electro-pneumatic motors. All our work is by the presents guaranteed for ten years, against any defect resulting from bad workmanship, or the use of unsuitable materials. We agree to find a competent tuner to look after the organ before and after the reconstruction. To insure the best result possible, temperature of the church will be kept as near as possible to the medium Sunday temperature while the tuning will be done. 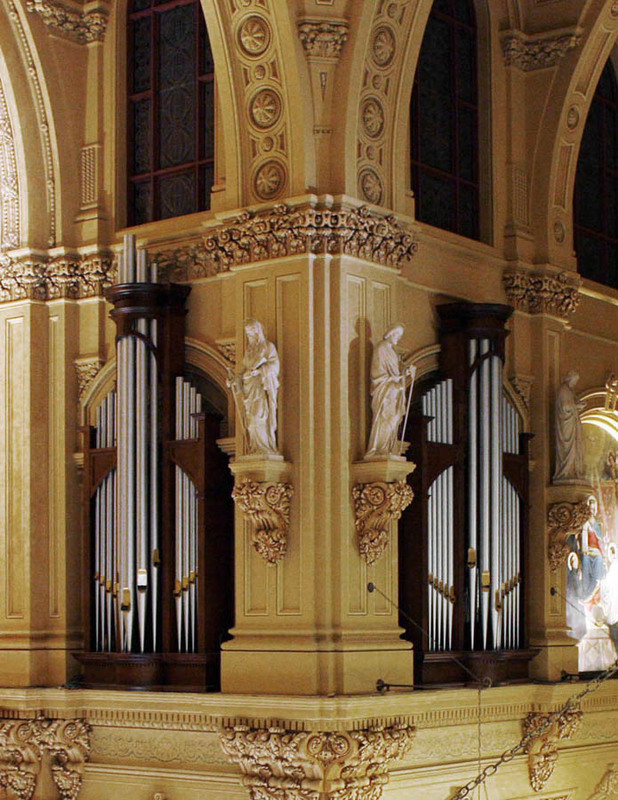 "The occasion of the completion of such an organ as we have placed in St. Francis Xavier's Church, New York, is one of more than ordinary importance to us, and to all interested in the advancement of the Art of Organ Building in this country. We therefore mark it by this Souvenir of one of the most perfect successes attained in this or any country, and one of which we justly feel proud. In the mere matter of size it does not equal the noted instrument built by us for the Cincinnati Music Hall, yet it is little short of it, and is by far the largest organ in New York City. In its completeness, effectiveness, finish of tone, and artistic excellence, it challenges the admiration of all. We commend it to lovers of the "king of instruments," and all interested in artistic achivements, and invite a careful study of its scheme and results, feeling sure that the art has not suffered at our hands in the execution of this carte blanche, and being willing to be judged by what we have done." These Couplers [above] are operated by pneumatic power and controlled by thumb knobs, placed over the Great Organ key-board. Fortissimo Pedal. Drawing all registers and couplers at once. Crescendo Pedal. Drawing all registers from softest to loudest at will. De Crescendo Pedal. Reverse of No. 2. Forte Great. Giving full Great Organ and an appropriate Pedale. Mezzo Great. Giving all 8 and 4 ft. registers and an appropriate Pedale. Piano Great. Giving a soft combination and an appropriate Pedale. Forte Swell. Giving all Swell registers and an appropriate Pedale. Mezzo Swell. Giving all 8 and 4 ft. registers and an appropriate Pedale. Piano Swell. Giving a soft combination and an appropriate Pedale. Forte Choir. Giving all Choir registers and an appropriate Pedale. Piano Choir. Giving a soft combination and an appropriate Pedale. Pneumatic Motors are applied to the Great Organ and all its couplings, the Pedale Organ, the two lower octaves of the Swell, and to the register action. The action is extended and reversed. 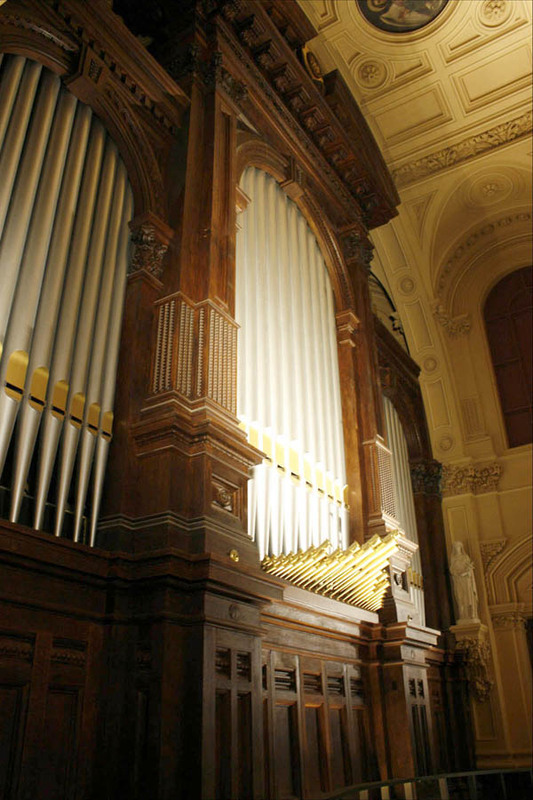 The motive power for blowing the Organ is the Boston Hydraulic Motor which is supplied with water from a tank placed in the attic above the Organ. An independent Chancel organ was supposedly installed in 1881 by the E. & G. G. Hook & Hastings company of Boston. However, the church archives have not uncovered any evidence that the organ was actually installed. Specifications for this organ have not yet been located. "This instrument was also built by Messrs. Hook & Hastings, of Boston, Mass. "It is inclosed [sic] in a casing of ash wood with tastefully decorated pipes displayed, and presents a very attractive appearance. "This beautiful instrument, though not ranking among the largest organs, is of more than an average size, and excels in its fine workmanship, elegant appearance, and artistic voicing. "The builders have sought to make the organ such as would meet every requirement of church service in the most complete and satisfactory way. To this end especial care has been taken in voicing to produce richness, fullness, and dignity of tone." It seems likely that this organ was based on the firm's "Size No. 11" specification (shown below), less one 58-pipe stop in the Swell (possibly 2' Flautino). 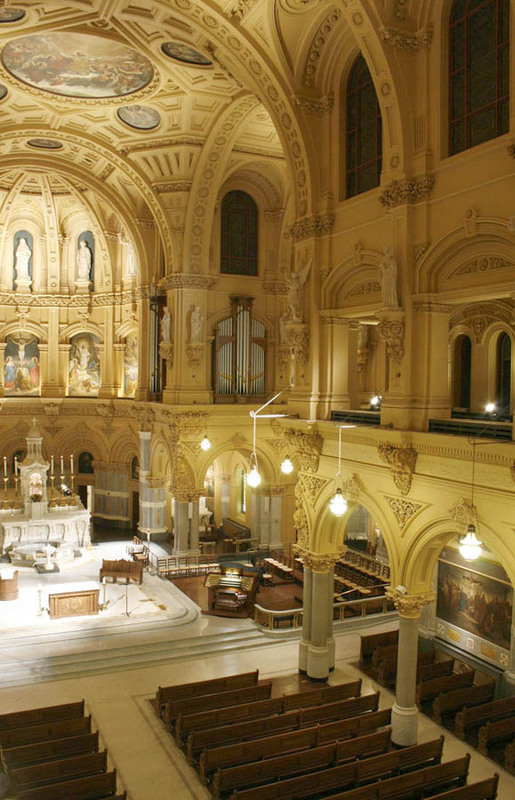 The organ in the original St. Francis Xavier Church was built in 1851 by Henry Erben of New York City. The American Organ Archives of the Organ Historical Society, Princeton, N.J. Specifications of Henry Erben organ (1851). "A New Church Dedicated," The New York Times (Dec. 4, 1882). "An Imposing Catholic Ceremony," The New York Times (May 6, 1878). Casavant Frères, Limitée Factory Specification, Opus 184, Jan., Sept., 22, 1902. Courtesy Stanley Scheer. "The Church of St. Francis Xavier," Frank Leslie's Sunday Magazine (March 1883). Nelson, George. Organs in the United States and Canada Database. Seatlle, Wash.
"A New Catholic Edifice," The New York Times (Nov. 29, 1882). Smith, Rollin. Specifications of Kilgen Organ Company organ, Op. 7813 (1957). Souvenir booklet, pub. by the church (c.1881). Description of the E. G.G. Hook & Hastings organs in the Upper and Lower Churches. Courtesy Larry Trupiano. "Trampled to Death," The New York Times (Mar. 9, 1877). Van Pelt, William T., comp. The Hook Opus List, 1829-1916 in Facsimile. Richmond: The Organ Historical Society, 1991. Webber, F.R. "Some Early Organs in New York City Described Vividly," The Diapason (Sept. 1, 1957). Specifications of E. & G.G. Hook & Hastings organ, Op. 1022 (1881). Courtesy James Lewis. eBay.com. 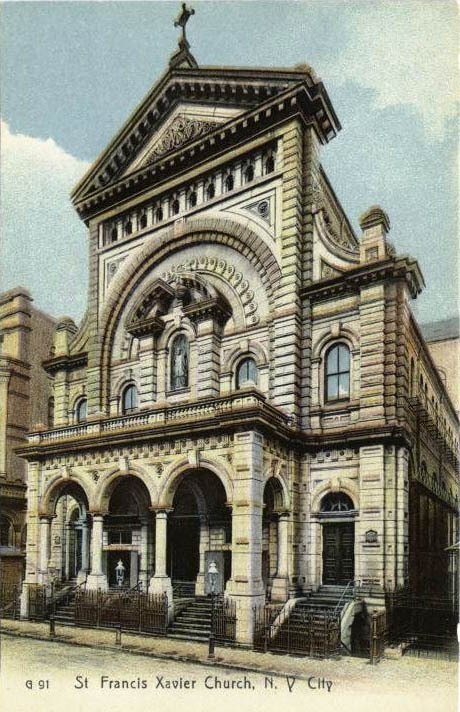 Undated postcard of exterior. Library of Congress Prints and Photographs Online. Exterior of present church. Lawson, Steven E. Church interior; Peragallo Pipe Organ Co. organ, Op. 700 (2010). Organ Historical Society. E. & G.G. Hook & Hastings organ case. St. Francis Xavier Church booklet, pub. by the church (c.1881). Drawing of E. & G.G. Hook & Hastings organ, Op. 1024 (1881) in the Lower Church. Courtesy Larry Trupiano. Underwood & Underwood Studios (N.Y.). 1919 photo of Pietro Yon at console of Casavant Frères organ, Op. 184 (1903).